Pope Francis has condemned “the blind violence” of “the cruel terrorist attack” in Barcelona on Aug. 17 and expressed his deep sorrow, condolences and prayers for the 13 persons that died in it. He assured the more than 100 people from at least 34 countries who were injured of his prayers and personal closeness. Fifteen of the injured are in critical condition. He told all this to Cardinal Juan José Omella, the archbishop of Barcelona, in a telegram sent on his behalf by the secretary of state, Cardinal Pietro Parolin, on Aug. 18. 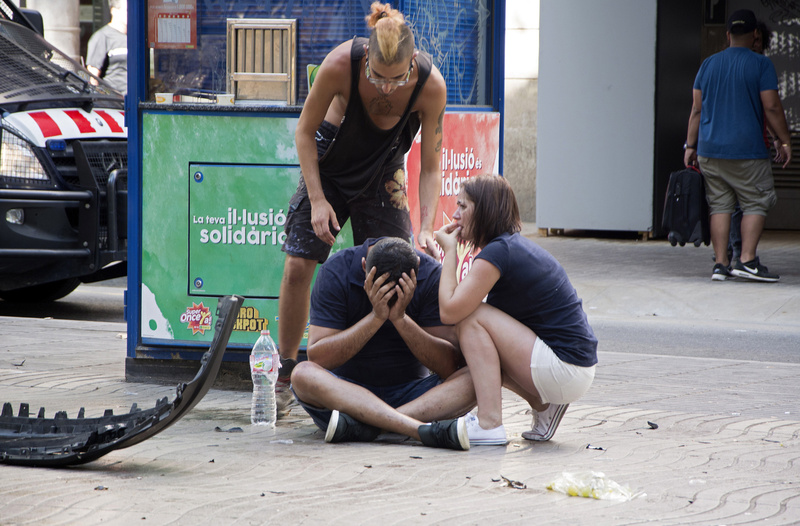 “In the face of this cruel terrorist attack that sowed death and pain in Barcelona’s La Rambla [district],” Pope Francis said he “wishes to express his deepest sorrow for the victims who have lost their lives in such an inhuman action, and he offers his prayers for their eternal rest.” At least 13 people died in the deadly attack yesterday afternoon, and another person died in a separate attack in Cambrils, a coastal town around 120 kilometers from Barcelona. Last evening, the Vatican spokesman, Greg Burke, in a statement, spoke of the pope’s “great concern” at the deadly attack as well as his prayers for the dead and injured and his closeness to their families and the entire Spanish nation. Before this mournful and detestable act, the Spanish Bishops’ Conference wishes, first, to express its solidarity and prayer for all the victims and their families. We also convey our support for the whole of society under attack by these actions, in this case the citizens of Barcelona, as well as for the Security Forces. I wonder who did this and what their motivation was? The article says nothing about this. The other article does mention who takes credit for it. Barcelona is my favorite city in Europe and one of the fun cities in the world. This will be a hit to their tourist trade. Love the Ramblas and I can see how this could be so devastating. Always crowded at any time of year. It seems that the same people who pontificate on Charlottesville have nothing much to say on Barcelona. I am pleased to see the pope speak out! I am saddened to not hear Arab nations condemn those acts, at least not in our media. Perhaps they do not want to kick the hornets nest in their own backyard. Offense against the Creator? Pope is hoping this holy war will just go away like fascists did in the thirties and forties. My bad, they didn't just go away, in fact, just the opposite occurred. For WWII and the creation of a stable postwar world, America does not get the credit it deserves from the Pope. Pope Francis needs to trust America, and leave real world issues to be dealt with those in the real world. Popes are the first to be fooled when the devil comes as an angel.